When you are married to a beautiful woman, you need to treat her with a favourite meal. She Who Must Be Obeyed likes a fillet of sockeye salmon. It is expensive but she is worth it. We had been out shopping and had picked up the fillet. I didn’t have time for marinading or brining or anything fancy so I decided to try it in my Louisiana Grills pellet smoker. I decided to cook it at a lower temperature to allow more smoke over a longer period of time. 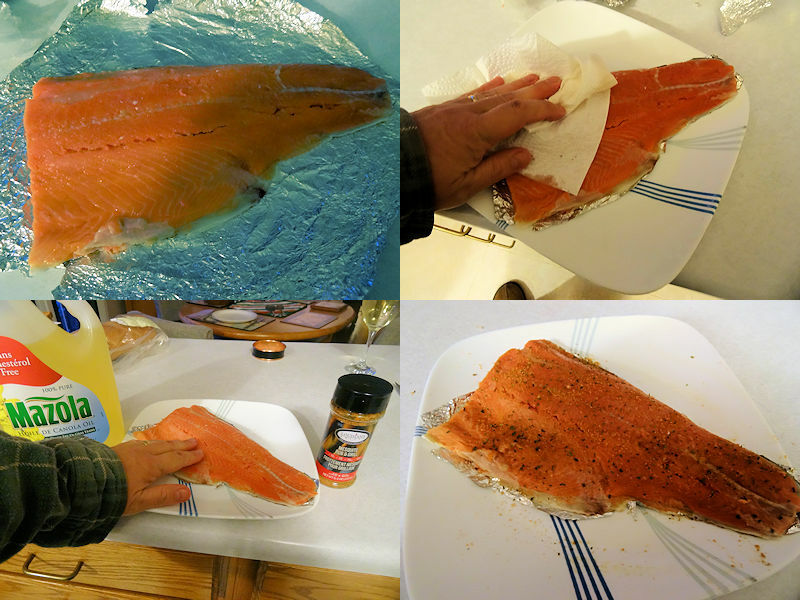 I put the salmon a sheet of aluminum foil and cut the foil in the shape of the salmon. Then I patted it dry with paper towel. I rubbed some vegetable oil onto the salmon and sprinkled a generous amount of Louisiana Grills Mesquite Rub on the salmon. I preheated the pellet grill to 225 F using Pitmaster Blend pellets and put the salmon in the grill. I cooked it to an internal temperature of 155 F. The pellet grill has an integral temperature probe that makes it easy to track the internal temperature. In all, it took just over an hour for this fillet to reach that temperature. 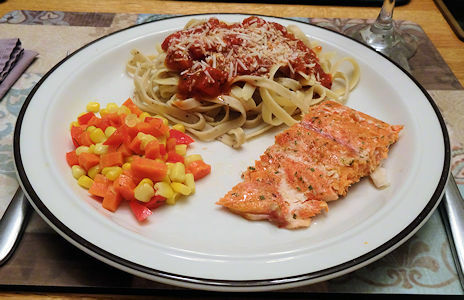 We served it with steamed vegetables, fettuccine and marinara sauce. There are many different varieties of salmon. The cheapest are pacific or chum salmon and farmed salmon. 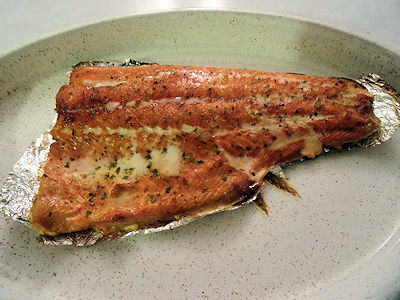 A good piece of wild sockeye is just so much better than the cheaper cuts. It has a fresh salmon taste and a great texture. The touch of smoke from the lower temperature and longer cooking was nice. The mesquite rub gave a nice salty smoke flavour that enhanced the smoke from the pellets. I am finding that food cooked in the pellet smoker seems to moister than food I used to cook on the grill or in my prior smoker. I believe that is from the constant movement of hot air around the food. This was a real treat but no less than She Who Must Be Obeyed deserved. Just don’t tell her how easy it was on the pellet smoker.